One week written notice is required for cancellations of the confirmed booking. Failure to cancel within this week will result in a cancellation charge equal to all nights. Groups will be required to settle a deposit (5 per person), for the keys and towel. Municipal tourist tax may be charged at check-in. Перевод Как следует из названия, Галерея Hostel Порту красивый хостел наполнен оригинальными произведениями искусства и расположены в районе, в окружении художественных галерей. Это примерно в 10 минутах ходьбы от центра города. Гости Hostelworld бы сказал, что они определенно рекомендую этот хостел », особенно, если вам нравится искусство и музыку. Этот хостел располагает летней террасой и зимним садом, бесплатный завтрак, очень доброжелательный персонал и ванные общежития. В частности, мы хотели их вкусные ночные португальские ужины, которые стоят около € 10. Welcome Home… welcome to the Gallery Hostel! At the Gallery Hostel, we strive not only to meet expectations but also to exceed them. It is our goal to extend a UNIQUE & MEMORABLE travelling experience to each guest… to always be remembered as one of a kind. By warm welcoming each guest, giving attention to the smallest details and sharing our knowledge of Porto city, we will make sure you feel comfortable, safe and well guided in our city… just like having family visiting! Located in the trendiest quarter of Porto, between art district and nightlife and a corner away from the Historical Centre. The eco-friendly Gallery Hostel characterizes the new concept of a luxury hostel, where best service, cleanliness and facilities are top priorities along with friendliness and familiar atmosphere. Gallery Hostel's secret lies in a soulful project with tons of character and dedicated staff members, planning to make you feel right at home! The project involved the rehabilitation of an impressive 1906 building seeking to maintain most of the original aspects of a traditional Porto house blended with a modern d'cor infusing neutral and earthy tones with unique textures and furnishings. Common areas are charming and stylish looking, a fair promise of design, relaxation and cosyness. 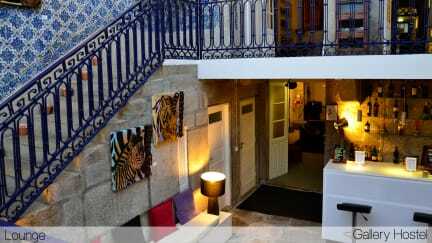 At Porto Gallery Hostel you will find most welcoming and helpful staff members and a laid-back atmosphere. The friendly staff takes you to free walking Tours around some of Porto's iconic places and shows you the secrets of Porto's art district. Gallery Hostel goes even beyond by fusing the hostel concept with an own Art Gallery and contributes with its bi-monthly changing art exhibitions, concerts and other cultural and artistic initiatives to the whole community. Our newest project We Care is our effort to protect the environment through different green initiatives such as recycling, solar water heating and much more. With a great know-how from Porto city, we will be happy to welcome you and recommend you the best places in Porto. It is our goal to make your stay a most memorable and enjoyable experience! Free towel, Free breakfast, Free walking tours, Free Wi-Fi! Перевод Я думаю, что то, что делает это действительно особенным наш бар, где гости могут насладиться хорошо подобранных напитков; мы готовим ежедневные домашние обеды с разными темами, которые являются типичными португальской кухни, разнообразные закуски и порт дегустации вин. Мы приветствуем гостей всех возрастов, которые ценят комфорт, вежливое обслуживание и заинтересованы в различных культурных аспектах, таких как хорошая еда, вино, искусства и т.д.